However, when that happens (and it will, at some point), you’re in trouble. Depending on what kind of devices you use on a daily basis, you might be unable to use anything from entertainment devices, to lights and locking devices for your home. Even worse, you might leave yourself unable to finish important work, whether it’s due sooner or later. Power outages are one of those things we don’t really plan on too far out in advance, until they actually happen and suddenly become a problem. This is where a portable electric generator comes in. A generator is basically a device that keeps energy stored inside. Once it detects there is a power outage, it switches on automatically and continues delivering power until the power comes back on. Depending on the size and capacity, it can continue delivering power for a few minutes, or a few hours. This also depends on how many devices you want it to power, and how many devices you are using at the moment. Regardless, having a portable power generator is a great idea. However, there are a lot of options on the market. From varying capacities, to various brands and models. Making the decision might be a bit difficult. That’s where we come in. We have created a list that has some of the best generators you can buy today. And we have them at various capacities and price ranges. What this means is that you’ll be able to easily get something that fits you, your requirements, and your home. Curious? Read on. And yes, in case you’re not really sure what you’ll need, we will also provide you with a buyer’s guide to help you out on that one too. Let’s get into it. Even though most small generators can’t really power up multiple home appliances at once, you can indeed use them during an emergency. The Predator 2000 Generator, as you’ll learn in this Predator generator review, is the best option for such usage. It’s the perfect balance between portability and power. Even though you might find generator ratings that only recommend it for emergency use, it actually gives you a very good value. Besides the fact that Predator generator parts and accessories are easily found since this is a well-known brand, everything about it screams quality. Sure, it isn’t the cheapest one on our list. It isn’t the most expensive one either. But it is absolutely the best combination between power, usability and price. This inverter generator gets you a very smooth power curve. That power curve ensures that the electricity you get is safe for use, regardless of which types of electronic devices you have. As its name suggests, this is a Predator Generator 2000 watt device. And yes, those 2000 watts are peak watts. If you need it for continuous use, it can provide around 1600 running watts. Even though this might not seem like a lot, it’s actually plenty for emergency situations and for basic appliances. In fact, you can use it for your lights, TV, dishwasher, freezer etc. If you want to use it as a work device, you can turn on sanders, be it belt or disk sanders, and cordless drills. For an outdoor scenario, grills and outdoor freezers are all good with it. What about the engine and inverter technology? The generator comes with a 79.7 cc air-cooled gas engine. This is what ensures that you not only get a lot of power, but longevity and protection as well. The engine, just like most of the parts that make it, are made in China by Predator. It starts through a pull on system, and there’s an electronic switch. What this switch does is allow for a lower fuel consumption and less noise. You can have it running and making around 61 decibels, which is ideal for home usage or in camping grounds. The inverter technology makes sure you get stable, clean electricity. This is essential when you’re powering devices such as tablets, smartphones and laptops, and makes it ideal for professionals who need this kind of power in the field. With its size and weight, you can easily bring it with you. That Predator we spoke about is excellent. But what happens when you want something a bit more powerful? Or maybe something a bit cheaper? Believe it or not, we have something that fits both demands. 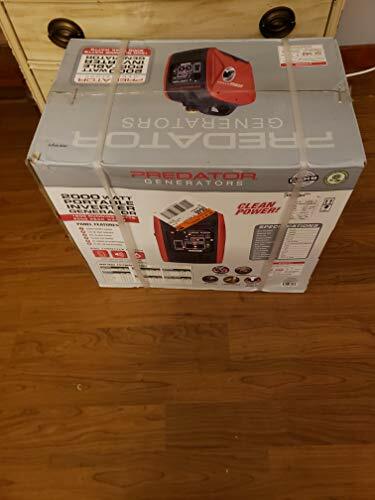 It might not be from a brand that’s as reputable as Predator, but the Champion generator price and the generator warranty might make you forget about that. Let’s take a look at it. The Champion 3500 watt generator is a powerful tool, and its 196 cc engine backs that up. The first thing you might find interesting is that Champion paid quite a bit of attention to safety. If the generator oil level is low, the generator shuts off. If you’re wondering about the Champion generator oil type required, it’s recommended to use 10W-30. Even though this is a 3500 watt generator, it actually has 4000 starting watts. If you have a full tank of gasoline, you can get up to 12 hours of run time. And the best thing? At 23 feet, the noise level is a mere 68 dB. You can easily use it in a variety of environments. When you’re looking at a Champion generator vs Predator, at least when compared to the 2000 watt one above, it’s clear that the Champion takes the cake as far as power goes. But it’s not just the power that matters, and the Predator generator is still our recommended pick, at least between these two. What additional features do you get with the Champion? We concluded it’s powerful, we concluded it’s far from expensive, and we concluded it’s safe. But those are far from the only things that are great about the generator. There’s a good selection of outlets, too. For example, you have one 120V 30A locking outlet, as well as a 120V 30A RV outlet, and a household outlet, 120V, 20A. It’s equipped with Volt Guard, a technology that protects your valuable electronics from an overload. You won’t be having any voltage spikes, and there’s also a voltmeter that gives you exact readings of the power output. All things considered, the Champion 3500 watt generator will be perfect for a certain type of people. Those who just want something powerful, but don’t want to overpay for it, and don’t care too much about the brand. That’s not to say Champion have bad products. Far from it. However, if the price to performance ratio is your top priority, this one is hard to beat. And if you don’t think it’ll last long enough, you have Champion’s three-year limited warranty with it, just to be safe. The Generac iQ2000 inverter portable generator is another great option on our list. Generac portable generators tend to be pretty competitive in the midrange field. The Generac iQ2000, to be exact, is a sine wave inverter generator, which by itself gives it a couple of advantages. To begin with, the power output is electronically controlled, giving it the option to run at variable speeds, depending on the load. Among other things, this saves you on fuel, as well as wear and tear on the generator itself. There’s also the Generac noise level, which is significantly lower when you aren’t pushing it to the max. You get three modes to choose from, turbo, standard and economy. Depending on how much load you need it to power, you choose the mode accordingly. You’ll find the power bar there as well, which is basically a load meter. It lets you select the level without overloading the iQ2000. As far as power goes, you get 2000 starting watts, as well as 1600 running watts. This is the same as the Predator that tops our list. Those 400 watts of extra power should be enough to start up your appliances. You can run something like a refrigerator, or an RV air conditioner with ease with it. If you want something larger, you’ll need two units. Yes, this means that the generator is parallel capable, and you can add one more unit to it. What about the rest of the Generac iQ2000 specs? If there’s one thing that’s absolutely worth mentioning here is that the generator is incredibly easy to use. There’s a PowerDial that makes sure that start/run/stop functions are all there, in a single dial. The power bar we mentioned above will let you see just how much wattage its using. And you have the three power modes, that might save you a bit of fuel, and reduce some of the noise as well. All things considered, you get quite a bit of functionality. What we didn’t really like is the fact that Generac keep on pushing the iQ2000 as a “better alternative” to Honda options. Everyone knows that Honda is the name to beat, and that sort of explains it, but it’s a bit too much. If you’re claiming you’re beating Honda, make sure you’re doing that in every comparison, which is not the case here. There are Honda options, from budget ones, to high end ones, that would wipe the floor with the Generac. But if you put that aside, the Generac is a decent generator in the midrange market. As you’ll see below, a dual fuel generator is a great thing to have. And the Champion Dual Fuel Generator is a great balance between price and performance. It offers plenty of power, while still keeping the costs low for what it is. A dual fuel inverter generator means that you can operate it with both gasoline, or propane. As we’ll discuss in the future, this is a very versatile thing, and a great option which might come in handy in quite a lot of situations. As far as power goes, we’re dealing with a substantial 439 cc engine. The Champion Dual Fuel generator is incredibly easy to start – no pulling, just a toggle switch. The battery for it is included. That engine gives you 7500 watts of power. And note that this isn’t the starting power. This is the running watts on gasoline. The starting watts on gasoline are 9375, and you have 8400 watts and 7650 watts on propane, starting and running respectively. This is the second Champion portable generator on our list, and you might be noticing a pattern here. Both of them are basically dirt cheap for all the power and functionality they offer. At this point, we can’t be blaming you if you’re asking yourself “What’s wrong with them? Is the Champion generator carburetor leaking gas or something?” and the answer would be a resounding “No. Nothing’s wrong.”. The reason these generators are more budget friendly than their competition is that you don’t pay for the name. With brands such as Predator and Honda, a decent amount of the pricing goes towards the name and reputation it carries. Champion don’t think they should charge for that, and you get functionality, power and quality on a budget. Does it sacrifice any extra features or build quality? Just like the previous questions – the answer remains “No”. You get Champion’s Intelligauge which makes sure to keep track of run-time hours, hertz and voltages. This easily determines power output and tracks any maintenance intervals. You also get the Volt Guard, which is a built-in surge protector and it’s pretty effective at making sure no overloads occur. Champion provide their three-year limited warranty, as well as their lifetime technical support with the 7500 watt dual fuel generator. As far as build quality goes, this thing is built like a tank. The 1.5 inch diameter tubular steel frame will make sure it doesn’t get damaged. You can take this anywhere you want with you, it’s rugged enough. There’s one glaring downside to it, though. The unit is incredibly loud. This is somewhat expected with an engine that pumps out this much power, but still, it could’ve been better. Our winner today is one of Predator’s generators. However, it only puts out 2000 watts, which is still great when combined with the other functionality it offers. The Predator 8750 generator is a whole different story. It isn’t meant to be that portable, and it isn’t meant to be that quiet. It is, however, meant to crank out a big amount of power, for a decent period of time. And it does that quite well. The largest one of the Predator 8750 generator parts is the engine. It has a Chonda engine. Yes, Chonda, you read that right. This is an engine that is reverse engineered from a small Honda engine, made in china. This is an informal name, but Harbor Freight Tools, Predator’s parent company, produce one such engine. It’s been somewhat replaced by cheaper and more fuel efficient engines (which are also weaker), but you can still find it around in 4 wheelers, lawnmowers and go-karts. The name implies that the Predator 8750 generator specs should give you a 8750 watt engine. However, that’s only the peak output. The continuous power output is closer to 7000 watts, which is still plenty. The 8750 Generator manual might tell you you can move it around, but it’s actually a heavy piece of machinery. That’s why it’s most usable for something like a large RV, or for emergency power. In the second case, you can use it for things such as heaters and large appliances, or you could run power tools off it. There is the Predator 8750 Generator wheel kit, and a large handle to help you with moving, but if you’re after a portable design you can use while camping, you’re better off with the Predator 2000.
Who is the 8750 good for? Certainly not for everyone. As we mentioned, this is a heavy piece of machinery that also costs a pretty penny. By getting it, you’re getting Predator’s quality and reputation, so the price is very well worth it. But, you should only get it if you’re buying it for the power, and not for the portability. Sure, it’s made very well, and the steel frame guarantees it will last you for a good while. However, once you see how big and heavy it is, you won’t want to drag it around. To sum things up, if you’re looking for a powerhouse that will last you for a good while, by all means, get it. For portable options, there are better ones. Generators such as the Predator 2000 or the Champion will be much less taxing when you need to take them with you. When you’re buying a generator for all-round use, the decision often falls between a model that doesn’t provide a lot of power, but is very portable, and a high-powered one that you can’t really drag around with you. But what if there’s a middle ground? What if you can get something that gives you more power than the ultra-portable ones, but you can still take with you? This is where the Generac GP5500 generator comes in. Don’t confuse it with the Generac RS5500, as that’s the other part of the GP5500 vs RS5500 debate. As its name suggests, this is a 5500 watts generator. And yes, those are running watts. You have 6875 starting watts at your disposal as well, all thanks to the 389cc OHV engine. That engine is built to last for a good while, and deliver power in a consistent manner as well. The tank can fit 7.2 gallons of fuel, which is enough for around 10 hours of run time if you use it at 50% load. This might not sound like too much, but if you’re careful, you won’t even be using those 50%, so you should get a tad more run time out of it. The GP5500 portable generator has a very portable design that manages to be compact and sturdy at the same time. You have a tubular frame made of hardened steel, and a foldable handle that you can easily hold with two hands. As part of the Generac GP5500 specs sheet you also get never-flat wheels, which are fairly big, and let you move it around with ease. Seeing as portability is a big part of an all-round generator, this is a welcome fact. What is the GP5500 capable of? As we’ve found, quite a bit. With the power output numbers we mentioned above, it comes right in the middle between a small, ultraportable generator, and a big one. It can absolutely power a fridge and a water pump at the same time, and you’ll be able to have your lights and TV set on. Having the ability to run for 10 hours at half load lets you sleep peacefully at night. As far as noise goes, there are low-town mufflers that absolutely keep the noise down. If you’re looking for the average generator for general use, this is it. Compact size, high wattage and decent portability make it a great all-rounder. It’s a reliable solution you can fall back to in case of a power outage. And you can use it to power various devices during an outdoor event, or even run a small business for a short while if there’s no power. As you’ll see from our Pulsar generator review, Pulsar’s products are a great combination of performance, convenience, quality and prices. Where are Pulsar generators made? In North America, and they don’t limit themselves to generators, but also have pressure washers and compressors. The result of some 100 years of investment in the brand is a well-known brand that’s still growing. We’re focusing on the Pulsar inverter generator, more specifically the Pulsar PG2000iS. The main thing about this Pulsar 2000 model is its size. When you first take a look at it, it’s hard to characterize it as a generator. It’s incredibly small, and reminds you more of a portable battery than a generator. This makes it incredible for taking it with you, be it on a camping trip or in your RV. As far as the design goes, we have to admit that this is the best looking generator on our list. You get a well-incorporated carry handle, and all the controls are conveniently positioned at the front. As far as power goes, you will get 1600 running watts, and 2000 starting watts. This is on par with a lot of other products, and that’s where the Pulsar PG2000iS vs Honda debate comes, as Honda has a competitive product with more or less similar power numbers. However, that one is a couple of times more expensive, so we won’t be comparing the two. We’ll be honest – admirably. The Pulsar is not only small and powerful, but it works very well. It will also last you for ages. You can’t use it for too much, but if you want to power light bulbs, smartphones, tablets or something like a refrigerator, it will work. Just not for too long, and you’ll need to refill it a bit more often. It is also relatively quiet, with average noise coming out at around 59 dB, more or less normal conversation volume. What is undeniably true is that the PG2000iS isn’t for everyone. If you’re looking for the absolute best in terms of brands, you’ll go with Predator or Honda. If you want the cheapest option, the Champion is the champion there. However, if you’re looking for a combination of both, in a generator that’s lightweight, compact, but still puts out a decent amount of power, you can’t beat the Pulsar. Bonus feature is that it looks incredibly good! The Predator 4000 is an interesting beast. It comes with the same build quality and performance we expect from the brand, yet the price is lower than usual. When you’re buying the Predator 4000 watt generator, you’re getting a decent power output and performance, as well as a design that’s very user-friendly. All the buttons and control panels are well made, and positioned intuitively. But, this is something that we’ve come to expect from a Predator generator. What you won’t be expecting is the small tool kit that comes with it. There’s a screwdriver, open end wrench and a spark plug wrench. When you want to change the generator spark plug, this will all come in handy. Refueling the tank is also very easy, as you have a top-mounted fuel tank. The capacity is four gallons, and filling them up is easy thanks to the big opening on the tank. Now, as its name suggests, you might be thinking this is a 4000 watt portable generator. However, that is the peak power, or starting watts. If you’re looking at continuous power, that comes out at 3200 watts. This is all thanks to the 212 cc engine which is air-cooled. Use it at 50% capacity, and you can expect around 10 hours of run time. There’s both an indicator and a shutdown function for low oil, which comes in handy in a couple of situations. Something that isn’t characteristic with this kind of generators is the noise level. Depending on the load, you can expect somewhere in the vicinity of 72 to 74 dB, which is fairly quiet. As far as outlets go, you will find two 120V 20A duplex outlets, 3 prong, as well as one 240V 30A twist lock outlet, 4 prong. There’s a 12V DC outlet too, which might come in handy and you won’t find on many models nowadays. All things considered, if you’re a fan of the Predator range of products, and are looking at a midrange generator, you should give it a shot. Sure, it doesn’t have a wow factor, nor is it incredibly light, but it’s a good all-rounder. It has a sturdy construction that you’ll love, and all the functionality a generator should have! We mentioned Honda a couple of times so far. And every time, we had something positive to say. So here we are, the one and only Honda generator on the list. And it’s the most expensive generator on the list, too. So, what’s so special about the Honda EU7000iS generator? Why does it stand out? What are the EU7000iS specs? Let’s take a look. Let’s discuss the engine first. The Honda EU7000iS inverter generator comes with the GX390EFI engine. Honda’s entire GX series is known for reliability and incredible performance. Add to that fuel injection, and you have a great combination. This is as close to indestructible as you’ll get with a gas engine. And you can be sure that you can start, and run that engine at temperatures from Northern Alaska’s coldest, to Texas’s hottest, if you maintain it well. It’s also CARB compliant, so you can expect very low emission levels. The fuel capacity is 5.1 gallons, and you can use it up to 18 hours on a full tank, if used at ¼ of its load. There’s one thing that really stands out with the Honda EU7000iS generators, and that’s the noise. More specifically, the lack of it. When you’re running it at maximum power, you won’t hear nothing over 60 dB. This is incredibly quiet, even for some lower power generators. Having 7000 peak watts at your disposal, and only making that much noise is seriously impressive. And then there’s Honda’s reliability and longevity. This may very well be the last generator you buy. However, you’ll pay for that privilege. The price is quite a bit higher than any of the other power generators on the list, and this is why we can’t really recommend it for everyone. If you can afford it, by all means go for it. But if you’re on a somewhat limited budget, there are better options. We’ll round up the list with the Ryobi 2300 watt generator. This is a very well made all-round generator that has a good amount of power, while remaining portable. As its name suggests, you’ll get 2300 watts out of it, and that’s the peak power. The running watts come out at 1800, which is still a respectable number from the Ryobi generator inverter. eally quiet, even at peak output. Competitive products can make a lot more noise, which makes it friendly in a camping environment. The generator Bluetooth functionality is something you won’t find with any other product on the list. You might be wondering why you’d need Bluetooth. Well, for monitoring everything from power consumption, to runtime remaining, fuel level, or even remotely shutting it off. The Ryobi 2300 inverter generator is also incredibly portable. You have a telescopic handle, as well as two rear wheels, which let you take it with you anywhere you need it. There’s also a suitcase carrying handle, if that’s more convenient for you. As far as outlets go, you will find two 120V outlets on this Ryobi generator, as well as 2 USB ports. These can come in handy when you want to charge something like a tablet or a smartphone. Now, this is another product that isn’t for everybody. If you want something really powerful, it isn’t it. If you want something that’s really cheap, it isn’t that either. But it’s a respectable product from a reputable company that has quite a bit of experience in the industry. The Ryobi Generator 2300 is fuel efficient, has an LCD display that shows you usable information, and performs really well. And if you don’t think it’s enough for you, you can get the Ryobi generator parallel kit, and add another one for double the power. What else could you be asking for? So, which is the best power generator for general use? If we had to choose one power generator for general use, we’d go with Predator’s 2000 watt one. There are a few reasons for that. If you’ve gone through our list, you have seen that there are more powerful ones on it. There are also cheaper ones. However, when you’re looking at a combination of value and performance, the Predator 2000 Generator is unbeatable. It lets you power your home appliances for a while in case of an outage. It lets you power your outdoor grill when you’re out camping. And it lets you power drills and sanders when you’re out in the field. It basically lets you do anything you want, as long as you don’t overestimate it. Yes, it won’t let you run your entire house for a week just off its own power. And you won’t be able to run an industrial building off it either. But devices that let you do that cost at least ten times as much, aren’t portable, and you can’t just put them in the basement. The Predator 2000 lets you do all of those things, at an unbeatable price. It’s also built to last for a good while, so you don’t have to buy new ones all the time. There are also some nifty features, such as the parallel capability, the high impact housing, and the electronic overload protection. All of these make the Predator a very good choice for a general use power generator. As we mentioned in the beginning, there are quite a lot of options on the market today. From a propane inverter generator, to a natural gas generator for home use, deciding on the right one for you can be tricky. That’s where our buyer’s guide comes in. Now that you know what kind of options you have available, you’ll need to know what you’re looking for. What price range? What capacity? Do you get a propane one, or a gas one? Let’s take a look at some of these essential things to know when buying, and help you make an informed buying decision. This is the first question you need to answer. And you’ll need to be honest with yourself if you don’t want to lose power in the middle of the outage. Regardless of whether you’re in a hurry, or have a bit of time to think about the size of the generator you need, you shouldn’t get this one wrong. Now, in case of a power outage, can you get by with just the basics? Can you just keep your food cold and your lights on? Or do you need something that will also power a heating system or central air conditioner? The easiest way of determining the size of the generator you need is to see how much your devices require. What you should keep in mind here is that some appliances might require a bit more wattage when they’re cycling on. Another thing to know is that some hard-wired appliances, like a furnace, might be a bit hard to estimate as to how much power they require. Your best bet would be to add up the wattage of what you’ll need, and then get something that’s rated a bit higher. This ensures two things. First, the generator has a bit of breathing room. Second, you can add an additional device or two later on in case you need it. For example, if you need a 4000 watt generator for your devices, buy a 5000 watt generator for a bit of breathing space. And if you need a 50 amp generator, get something a bit stronger, etc. You get the point. For additional help, here’s a bit of a cheat sheet. Don’t take these numbers for granted, but they should help you out in case you don’t know your exact numbers. • Small, portable generator (3,000 – 4,000 W) powers a microwave (1,500 watts), refrigerator (600 watts), several lights (400 watts), a sump pump (600 watts) and a TV (200 watts). This should cover your essential needs. • A midsized portable, or a small stationary generator (5,000 – 8,500 W) powers the same as a small one, plus a computer (250 watts), heating system (500 watts), second pump (600 watts), a portable heater (1,300 watts) and a few more lights (400 watts). • A large portable generator (10,000 W) powers all of the above, plus a central air conditioner (5,000 watts), small water heater (3,000 watts) and an electric range (5,000 watts). • A large stationary generator (10,000 – 15,000 W) powers all of the above, as well as an electric dryer (5,000 watts) and a clothes washer (1,200 watts). At their core, power generators are basically combustion engines that require some sort of fuel. Most of them either use propane or gasoline. The more common ones are gas generators, but propane ones have been picking up a lot of steam lately. Both fuel types come with their pros and cons, so let’s take a look. Considering that gasoline is fuel that can be easily obtained and is very common, gas generators are fairly common. All you’ll need to fuel it up is to go to your closest gas station and fill up a gas container. Considering how many gas stations we have around us at all times, you can fill up a gas, or portable diesel generator wherever you are, very easily. However, even the best home generator that’s gas-powered has downsides. The first downside is something we’re all familiar with – pricing. Gasoline can be pretty expensive. And during an emergency, fuel costs have been known to increase a bit as well. If you’re using fuel that’s expensive, you should be well prepared to spend a pretty penny. The next bad thing is toxicity. Gasoline pollutes the air when you burn it, and the fumes are toxic to breathe. Spilling it is also very easy, and it’s very flammable. All things considered, it only takes a spark to cause an accident with gasoline. You should be aware of this, and be extra cautious. If you need your generator as a way of getting power during an emergency, there’s one thing to consider. A gas station needs electricity to be able to pump gas. Meaning, you will need electricity to get fuel for your generator, which in turn generates electricity. The common solution to this is to keep gasoline in a barrel, for example in your shed. This can be dangerous, and gasoline has a short shelf life. You’ll need to either use it, or dispose of it, within a year. Propane is a bit of a different story. It became famous for grilling your burgers and steaks during the summer, but it has quite a few advantages over gasoline. For example, it comes in cylinders that make it almost impossible to spill. Even if you do happen to spill it, it evaporates immediately, and it’s clean burning. Its price is also about half of the prices of gasoline. And last but not least, a propane powered generator is usually quieter. The best quiet portable generator options tend to be propane because of this. Note, however, that you shouldn’t confuse natural gas generators with propane ones, they aren’t the same. In case of an emergency, you can still get propane when you have a major power outage, since it doesn’t require electricity to fill a tank of it. Its shelf life is also very long, and it might even outlast the tank you’re storing it in. Your only concern here is to maintain the tank itself. Knowing this, you only need to maintain the tank, and you can store it indefinitely. It does have a flaw, though, and it’s the fuel system. A propane generator is oftentimes much more complicated and has a much bigger chance of failure. And in case it does fail, it’s much more difficult to fix when that happens. Propane is also much less efficient than gasoline. And if you have cold weather, below 20 degrees Fahrenheit, it’s more or less useless. To sum things up in the propane vs gas generator battle, the best portable generator will let you use both fuels. You can have gasoline’s accessibility for your everyday use, and you can resort to propane in case of a crisis. This is the best of both worlds, and if you can get a home backup generator that does this, by all means go for it. Just read a couple of dual fuel generator reviews first, to see which one works best for you. When we’re talking about types, we’re actually discussing about the application they’re used for. They generally range from smaller ones (which are the ones we focused on in our list), to larger, stationary devices. Let’s take a look at each type and see what’s the best generator for home usage. This is where the best RV generator and the most quiet RV generator would be. They’re often used for camping, motor homes and caravans, as well as for fishing, boating and even some small events. This is where you’ll find the best inverter generator, as all units in this range tend to be inverter generators. As you’ll see in many inverter generator reviews, the inverter technology ensures there’s clean voltage. This is essential for powering devices which have sensitive electronics such as laptops, phones, TVs etc. A small portable generator is quiet, compact and lightweight, as well as economical. If you need one for camping battery packs or appliances, they’re perfect. You could also use them as a small portable backup during a blackout. Most portable generator reviews usually focus on these as they’re the right fit for just about anyone. Well, provided you set your expectations right, that is. If you’re looking at a portable trade generator, this is commonly where you would find something like a portable diesel generator. They’re most commonly used at construction sites, building, rural properties and farming, as well as with power equipment, welding and tools. They’re commonly built to be tough, with steel frames and have condenser alternators. This makes them ideal for heavy and resistive loads. You can also find Work Cover Approved models which also have necessary worksite safety features. There are some more specialized types, such as workstation generators, welder generators and mine specification generators, each with their own use. Within this category you will find everything from a small inverter 1000 watt generator, up to an automatic voltage regulation one. These are the self powered generator options that are used to run appliances during a power outage, and can be used as a direct backup to a small business or house mains, or an off-grid solar power. They’re suitable for running small appliances, and which one you go for depends on how many appliances you’re running and how big they are. You can find more info above, where we discuss the sizes. When you’re living in a storm-prone area, a portable generator is a must have for your home. These are the big, bad generators. They’re the exact opposite of something like a portable natural gas generator, since they’re big, immobile and made for large applications. Common usage scenarios include large commercial applications, mine sites, healthcare, large events, as well as data centers, utility companies and government or council buildings. They provide significant power for both standby purposes, as well as continuous requirements. They are commonly either diesel, or three-phase, and you’ll need a crane or a forklift to move them. You can often configure outlets to suit the task at hand, and they’re almost exclusively used for commercial use. As we said at the beginning, choosing a generator isn’t an easy task. Sure, you can begin by setting a budget, but within that budget are loads of options. From various companies’ offerings, to various power specifications and types, it’s easy to buy the wrong generator. However, with the list and buyer’s guide above, we hope to have given you a bit more details. If you want to make an informed buying decision and not a mistake, you’ll need to consider quite a few things. But when you do, and when you have an honest answer as to what you need from your generator, all you need to do is choose from the list. You have options at various price ranges, and some are better than others at some things. Depending on what you need, whether it’s a small portable generator for your camping trip, or something a bit more powerful to use as a backup for your entire home, we have something for you. All you need to do is decide which one, and press that “Place order” button!